In Magento selectable grids, each time after a grid operation is performed (whether it’s filtering the results, pagination or something else), the selected values get lost. In other words, Magento by default keeps only values selected after the grid is initialized in the beginning and loses them each time the grid gets reloaded by Ajax call. 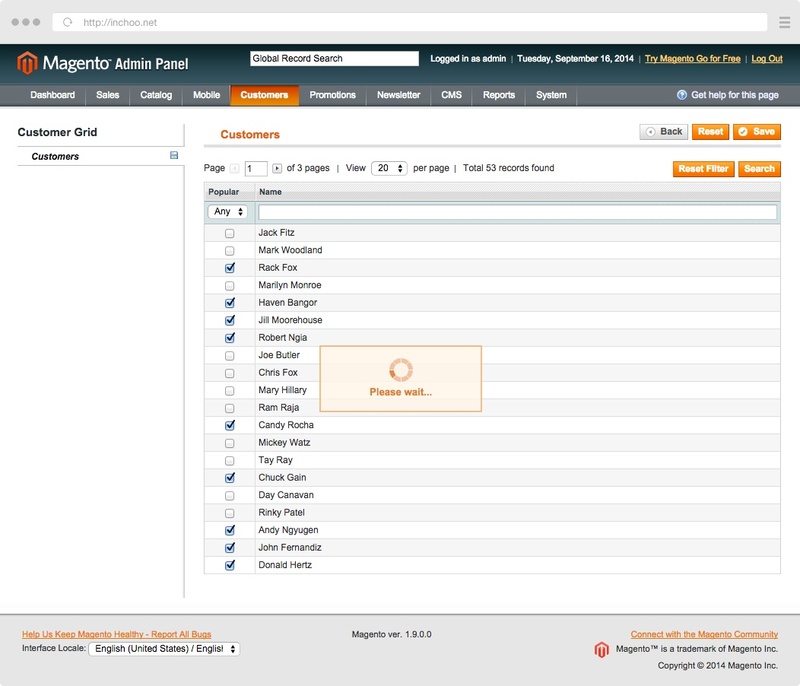 Fortunately, Magento has a built-in library called Grid Serializer to solve this issue. Before we start with the code, as this is a bit more advanced grid, it is assumed that you’ve already mastered the basics of Magento grids since only differences will be shown how to create ajax-like grids. It is already said that Grid Serializer splits the grid in two parts where only the grid gets reloaded, leaving the rest of the page intact as opposite to default action where the entire tab is reloaded. In order to make that happen, layout and controller has to distinguish those two parts. As it can be seen on the image below, we have to separate the entire tab content, which initially includes the a hidden input type and the grid itself, and the grid that will be replaced. For this we’ll need to have two actions defined in both layout file and controller: customersTab and customersGrid (or the tab and grid content). Visible in the code below, the tab content defined by the handle includes both the grid content and the hidden input type blocks, while the grid-only content defined by the handle is a stripped version of the tab content, containing only the grid block. In order to make Grid Serializer work, all those things have to be linked somehow, which is why the hidden input field has a few parameters left to be defined. Having the layout defined, controller has to add some actions to those handles. The tab action (customersTabAction) is supposed to collect the id’s, which is usually a collection that returns the id’s as array, to load the block defined in the layout and to set the selected id’s. The grid action (customersGridAction) does the similar thing to the tab action, again, but the difference is that the selected id’s are read from the URL parameter which is defined in the layout (reload_param_name). In the save action selected id’s are taken from the hidden input field from the parameter name defined in the layout (hidden_input_name). Grid Serializer comes with a handy method called decodeGridSerializedInput() which decodes a string into an array. Having the structure of the tab defined, there are only a few things left to change in the blocks. Let’s start with the Tab block first. In the _beforeToHtml() method, where the tabs are usually defined, several parameters have to be changed. The first thing would be to omit the content parameter, that is usually set by default, and to replace it with the “url” parameter. That parameter has to define an url for the tab content. The other thing would be to add a class parameter with the value “ajax”. The last file that has to be changed is the grid block itself. One thing would be to use a variable containing the selected id’s, which is set by the controller (getSelectedCustomers() in this example). The other thing would be to define an URL of the grid content, which is why a getGridUrl() method is defined. Make sure to have setUseAjax(true) variable defined as well. Not a lot of changes are needed to create ajax-like grids in Magento by using Grid Serializer while a lot of things can have benefit of that. With this library selected id’s are preserved on grid reloads which is why pages can be changed, filters applied, sorting changed without losing the selection. Additionally, the grid won’t be populated and collections won’t be run until the tab is selected. Having that in mind, it has to be extra careful when saving id’s since it has to distinguish whether none of the id’s are selected and when the tab is not loaded at all. There’s a small glitch that I have found when working on this. When viewing a grid on smaller screens where the grid can be scrolled up and down, each time a row is selected the page jumps to the top. It’s a bit irritating, but looking around in Magento I have found a few of the pages that use Grid Serializer natively and that share the same problem (some of the pages have custom solutions), but that’s really a tiny thing compared to what the library offers. - This extensions enables you add many attributes as possible to the product grid easily so that you can show all the information you want on your product grid and make them more informative and functional than ever. - With this module, you can pick out any product attributes based on your need directly and then fast Ajax will support you to manage and edit product data right on the grid. - Using this extension, you are able to show thumbnails in Magento product grid. Because you can see product images, you will do assignments with much higher accuracy. - This Extended product grid column also allows many admin to manage Magento product attributes. Therefore, if your product catalogue has some administrators who edit different attributes, each of them can configure the product grid easily based on their need. - You can easily manage product columns by organizing them in your favored order. - This extension enables you to disable/enable these product grid columns effortlessly. - Magento product grid also help you to pick up the right products with it’s product grid tool. In addition, you can see full image by clicking on the thumbnails. - If you need to find some products which are not assigned to categories such as new imported products, this extension will allow you to find them easily. - Using this extension, you are able to show related, cross sell and up sell products on your configurable grid. Awesome ! your agento Grid Serializer for Ajax Grids views.I really really like you.Thanks for sharing information all of you.Thanks again. Matrix Serializer parts the framework in two sections where just the network gets reloaded, leaving whatever remains of the page flawless as inverse to default activity where the whole tab is reloaded. So as to get that going, format and controller needs to recognize those two sections. As it tends to be seen on the picture beneath, we need to isolate the whole tab content, which at first incorporates the a concealed info type and the framework itself, and the matrix that will be supplanted.